A huge congratulations to Kansas City–based Hanna Rubber Company (Hanna Acquisition Corporation) for achieving ISO 9001:2008 registration and stepping up its game in the global competition. The 92-year old producer of industrial rubber and plastic products employs 37 people at its Kansas City facility. 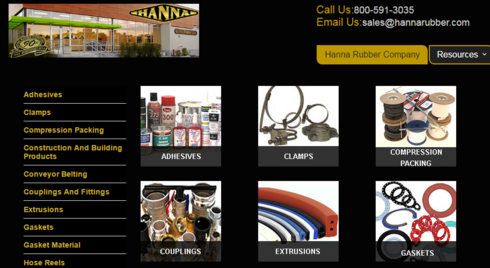 Hanna Rubber it fabricates and distributes standard and specialized rubber and plastic products for the construction, automotive, military, industrial and manufacturing industries with customers in all 50 states and a number of foreign countries. ISO 9001:2008 registration shows that Hanna Rubber has achieved standards of quality that are recognized and respected throughout the world. To earn ISO registration, the company had to meet comprehensive quality management system requirements and pass a rigorous audit by an independent, third party registrar. The company stated that it is committed to meeting and exceeding all customer requirements and expectations and to continually improving quality management. “Registration is a major step in maintaining our business position and product quality in support of our customers,” said Scott Assyia, Hanna Rubber Company Vice President and General Manager. “It will also enable us to grow and to enter new markets where registration is a prerequisite for consideration,” he added. During the registration process, Missouri Enterprise Quality Management Experts provided Hanna Rubber with a comprehensive gap analysis to map the process. This included documentation preparation and implementation assistance as well as auditing and on-site support. “In the Gap Analysis, they helped us understand the registration process, so we could avoid false starts, unnecessary work and delays,” Assyia said. Missouri Enterprise is an organization composed of experienced manufacturing and management professionals who provide business and technical assistance to help Missouri companies succeed. It manages the Manufacturing Extension Partnership program in Missouri and one of the state’s Innovation Centers. Learn more about Missouri’s strong manufacturing industry.